We celebrated our 35th Anniversary on April 23, 2017. View a slideshow of the ceremony and more historical photos. 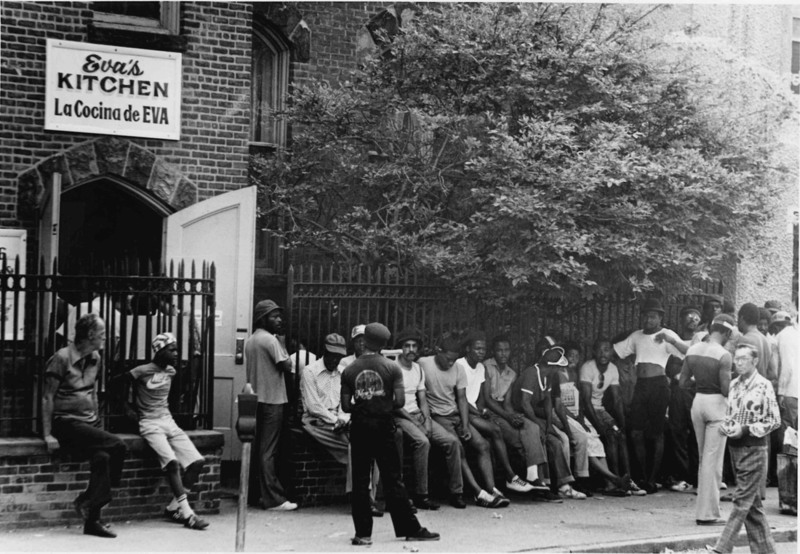 Feeding the most neglected and vulnerable members of our community may not sound revolutionary, but in 1982 at the height of the recession, there were few services available to people who were struggling with hunger and homelessness in Northern NJ. The idea for a soup kitchen was suggested by The Paterson Council of Priests, who noticed an increase in numbers of people coming to rectory doors asking for food and housing. Msgr. 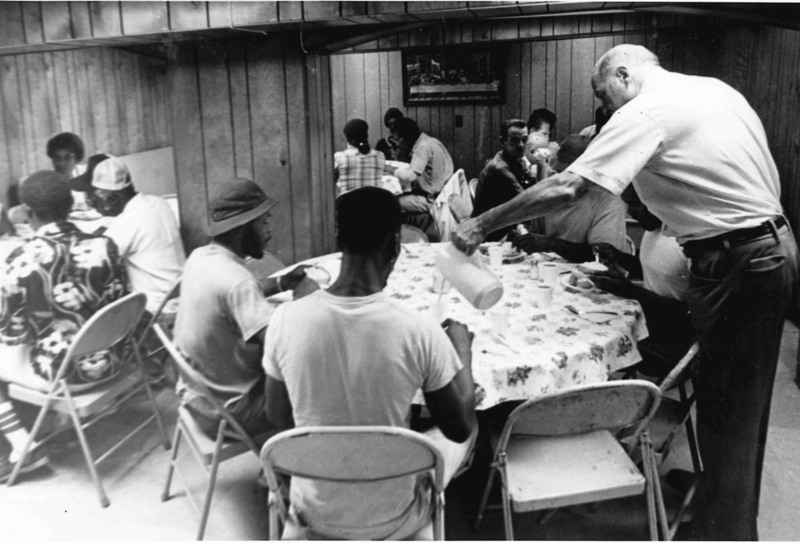 Vincent E. Puma, who chaired the group and had long had a vision of delivering “person to person, people to people” care to those in need, led efforts to get the kitchen project - the first of its kind in Paterson since the Great Depression - off the ground. Each of the priests on the Council agreed to tithe a portion of his parish’s collections in order to fund the project, and space was volunteered in the basement of the Sisters of Charity convent located at St. John’s Cathedral on Grand Street in Paterson. The kitchen was named for Sister Eva Hernandez, the first Kitchen Director, a Missionary Sister of the Immaculate Conception who had stepped up to help with the project after hearing a plea from the pulpit in a local church. Sister Eva was the daughter of two cooks with brothers in the restaurant business, and she had experience organizing food and housing assistance for migrant workers in her native Texas. The name “Eva’s Kitchen” was fitting for two reasons: Eve was the mother of all, and the Sister’s name backwards spells “Ave.” The name leant warmth and welcome to the small basement space. After a few months of hard work, refurbishing salvaged restaurant equipment and setting up donated tables and chairs, Eva’s Kitchen served the first meal of franks and beans to 30 hungry guests. Within days, the 75-seat dining room was at capacity and a second seating was added. Soon the kitchen was feeding more than 200 people a day. It was obvious that the little kitchen was nourishing something important in the souls of both the poor and their many benefactors. News traveled fast, and many volunteers stepped up to serve, organize and clean up meals. 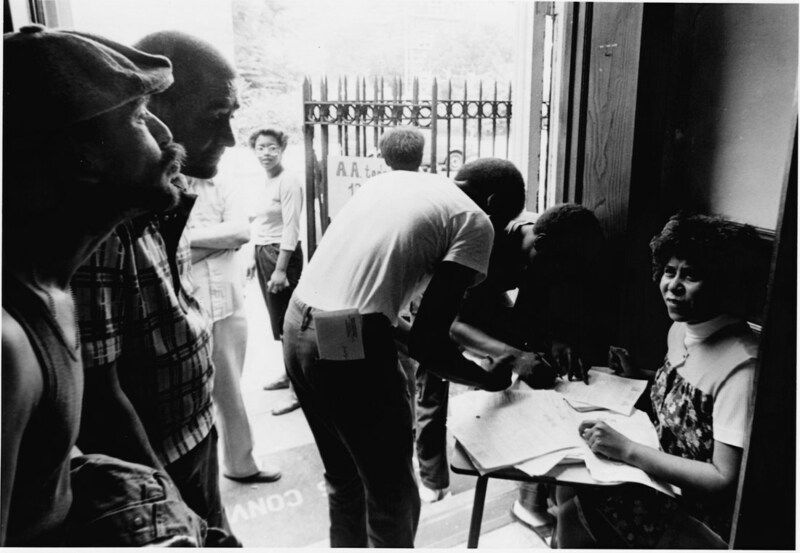 View more historical photos and images from our 35th Anniversary celebration here. Right from the beginning, Eva’s Kitchen provided more than food and warmth - the basement kitchen quickly became a hub, offering free medical and mental health screenings to guests and referrals to substance use treatment programs, social services and jobs. 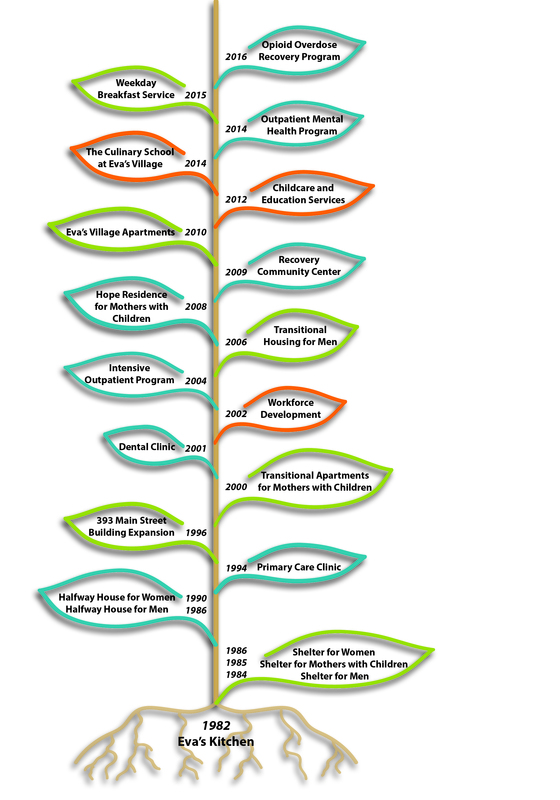 A few years later shelters were opened, and then treatment and recovery programs to help people overcome addiction and cope with co-occurring disorders. Msgr. Puma believed that “When you take someone’s hand, you cannot drop it until they can stand on their own two feet.” Over the last three and a half decades, following in our founder’s vision, ​​countless volunteers, thousands of supporters, innumerable community groups, and dedicated staff have worked to integrate and expand the supportive services and programs originally offered by Eva’s Kitchen to meet our neighbors’ urgent and emerging needs. ​Today, Eva’s Kitchen has evolved into the 20 integrated anti-poverty programs of Eva’s Village, where guests are still welcomed each day with a warm smile and a hot meal; and ​where thousands of men, women, and children each year find hope and a path to a brighter future.